Is your car looking worse for wear? In the busy city of Ajax, many residents commute within and outside the city for work and leisure, and this can put a strain on your car’s interior and exterior. Between regular driving and harsh weather conditions, your vehicle withstands a lot of wear and tear from the build of dirt, debris and corrosive salt. While most vehicle owners are on top of internal maintenance like oil changes, they neglect deep cleaning of interior and exterior surfaces and tires. Deep cleaning or detailing, of these areas can help find issues before they become major problems, keep your tires in good shape and make your car more enjoyable to drive. With Car Detailing Shop, we make getting essential car detailing in Ajax easier than ever. To ensure our customers get the services they need to keep their car safe and in good condition, we’ve developed our 100% mobile Ajax car detailing. Book your Ajax car detailing today by calling Car Detailing Shop at 647-920-5199 today! How is Car Detailing Shop Making Ajax Car Detailing Easy? 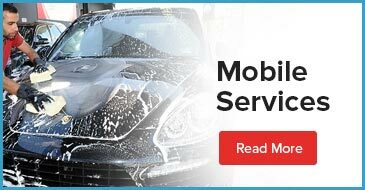 100% Mobile Car Detailing: Our mobile units come equipped with all the tools and products we need to give you superior service for the interior and exterior of your car. This includes both water and electricity, so we can service your car anywhere you need us! Environmentally Friendly: Car Detailing Shop is committed to the well-being of our customers and our environment and this is why we use water-saving steam cleaning for interiors and only the safest products and methods. Customizable Packages: We offer a full-range of Ajax car detailing packages including customizable interior only and exterior only options. We also have add-on services like special deodorizing treatments and pet hair removal. Convenient Scheduling: Car Detailing Shop has our detailing down to a science and can give you accurate estimates on how long each of our services will take to ensure your car detailing fits in your busy schedule. Check out our car detailing time estimates to find the right one for you. Car Detailing Shop knows schedules are busy and we value our customers’ time, so we make booking an appointment simple and efficient. To book your appointment, use or quick Contact Us form.